I highly recommend finding a really good Lebkuchen or gingerbread spice mix for these (or make your own!) … and be generous with your use of spice, as you are generous with your spirit at this time of year. They make a lovely gluten-free treat for family and friends who may not be able to enjoy other Christmas treats. They are gluten-free and can be low FODMAP (so long as you do not add any casein powder and only use dark chocolate chips). It’s great to not feel left out at times of celebration and family gatherings. I have included the macronutrient profile for the cookies below the recipe as usual, for those of you who keep track of these things, as I do too. Do check out my other Lebkuchen spiced Christmas desserts here and here … seriously, if you haven’t tried this spice mix, you haven’t lived! Lots of other Christmas recipes on the blog too. Lebkuchen spice is a German gingerbread spice mix. Substitute your favourite gingerbread spice if you cannot find it. I recommend making your own fresh almond butter (it’s fresher and cheaper too) but realise that many of you prefer to buy it. 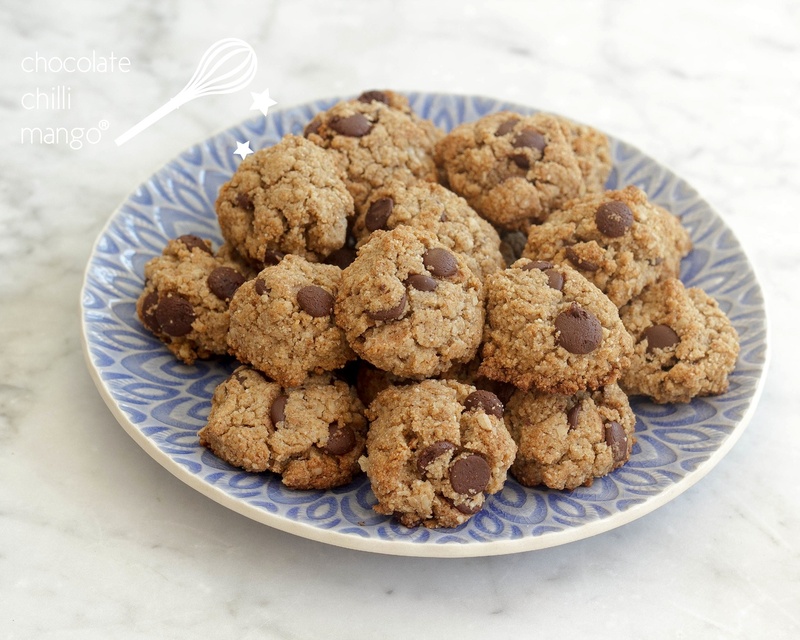 Both the oats and the protein powder are optional extras in these moreish cookies. Personally, I would recommend the oats, as they lend a little extra oomph factor. I’ve added the protein powder just as an extra because I often add it with great results It really doesn’t add a great deal to the protein content of each cookie unless you make the cookies fairly large 😉 Unflavoured or vanilla casein or pea protein isolate work best in this recipe but you could substitute whey. Whey is fine but will make them more crumbly in texture as it has a drying effect. These cookies also work well with either your favourite brown or unrefined sugar (coconut, maple, and rapadura are all fantastic for these cookies). 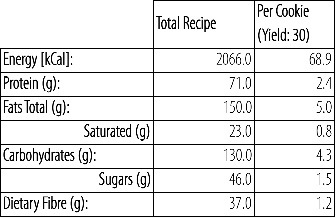 Granulated sweeteners like Norbu or Natvia are also excellent, if you need to reduce the carb content. They are great with dark, milk, or white chocolate chips! Line baking trays with non-stick baking paper. If using whole almonds, dry roast them in a 180°C oven until they are just golden and you start to smell the aroma. Let cool until just warm, then process to a smooth paste in a food processor. Place the almond butter, sweetener or sugar, oats, protein powder, bicarbonate of soda, egg, lebkuchen spice, and vanilla into a large bowl. Stir to combine. Roll heaped teaspoonfuls of mixture into balls and place on the baking trays, allowing some room for spreading. If you like, press very lightly with a fork or a flat knife. Bake cookies for about 8 – 10 minutes until golden. Be careful not to over-bake them or the base will burn. Remove from the oven and allow to cool on wire racks. The cookies will be soft when taken out of the oven but will crisp up a little as they cool. Store in an airtight container, away from heat, in a cool, dry place. I have included the macros for the recipe using Norbu as the sweetener as well as using brown sugar, but without the added protein powder (simply add on the macros for the supplement you choose, if using). If you substitute ingredients or add in extras, you will need to account for these changes.